After WWII the Canadian army began to “spool down” quite rapidly and retire or scrap many of the Commonwealth weapons systems it had used during that conflict. While they kept the field artillery regiments with 25-pdr guns, the medium artillery with 4.5" and 5.5" weapons were packed in. While Canada did not need a wealth of weaponry during peacetime, it was decided early on that it must be able to deploy with its own weapons and also it must soon meet NATO requirements. The decision was made to lean towards American made weapons for the standardization approach, and for medium artillery the winner was the American 155mm caliber. Thus in 1951 the Canadian Army replaced the older British weapons with the American M1 (later M114) 155mm towed howitzer. This was chosen over the bigger M1 155mm gun as that was considered heavy artillery, and at the time every American division had one battalion of 155mm howitzers. So in the mid-1950s the Canadians adopted the M1A1 version of the howitzer. They modified it slightly to become the M114Cdn as of 1962. Each regiment of the Royal Canadian Horse Artillery (RCHA) had one six or eight gun battery of M114Cdn guns and three 105mm ones. The M114Cdn was a popular weapon, but as everyone else switched to modern SP weapons the Canadian Army followed suit in 1966 and purchased 50 M109 howitzers. These were followed later on by 26 guns for 4th CMBG in Lahr and were fielded with the 1st RCHA. I personally met one of their batteries in 1975 when my platoon was collocated with them during REFORGER 1975; the guns were clean, well-serviced and popular with the gunners. At that time they were some variation of the M109A1 or A1B with the 39 caliber long barrel. While Canada did not opt for the “high tech” US M109A6 Paladin version, they did continually upgrade their guns to M109A4 or A4+ levels. But with the end of the Cold War and changing requirements, many armies now turned to high mobility weapons and the US and Canada were no exception. The US needed a high mobility gun for areas such as Afghanistan and the 30,000 pound towed M198 was not the answer. After much testing of various prototypes, the answer turned out to be the British Vickers M777 lightweight 155mm howitzer at 9,200 pounds, which meant it could be moved by either a Chinook or Super Sea Stallion helicopter. In 2005-2006 the Canadian Army also obtained M777s for use in Afghanistan and also used RCAF Chinooks for deployment of the guns. Today this howitzer is the standard Canadian piece. 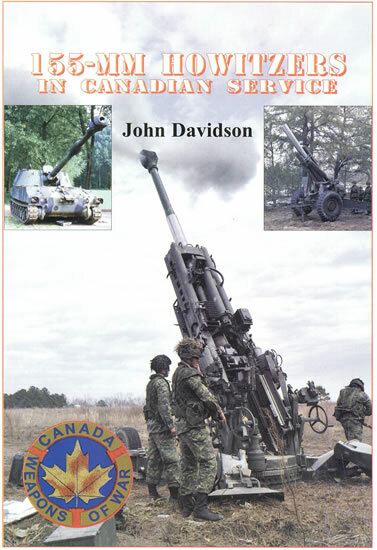 Overall this is a nice book and also explains artillery terms (“Gun 101") for those not familiar with them.